Taxi Mike's Guide to Hiking! Aylmer Pass 13.3 km one way, elevation gain 810 m, 8 hours round trip. Trailhead: From the Minnewanka Interchange on the Trans-Canada Highway take the Lake Minnewanka Road, following it to the west end of the lake 5.5 km beyond the Trans-Canada junction. Park in the large parking lot just above the tour boat concession entrance. At a junction near the Lm8 campground, the Aylmer Pass trail branches north from the lakeshore trail and climbs steeply to a 2285 m summit. Aylmer Lookout 11.6 km one way, elevation gain 560 m, 7-8 hours round trip Trailhead: Same as Aylmer Pass. Stewart Canyon 1.4 km one way, no elevation gain, 1 hour round trip. Trailhead: From the Minnewanka Interchange on the Trans-Canada Highway drive Lake Minnewanka Road 5.5 km to the parking lot at the west end of Lake Minnewanka. The Canyon trail becomes faint after several km. Trans-Canada Highway drive Lake Minnewanka Road 3.5 km to the Upper Bankhead picnic area, on the left. Johnson Lake 3 km loop, no elevation gain, one hour round trip Trailhead: Johnson Lake picnic area. Trail follows the shoreline. Tunnel Mountain 2.3 km one way, elevation gain 260 m, 2 hours round trip. Trailhead: Follow Wolf St. east to St. Julien Road. Follow St. Julien uphill to the parking lot on the left, 0.3 km from the Wolf St. junction. Bow River / Hoodoos 5.1 km one way, elevation loss and gain about 60 m, 3 hours round trip Trailhead: Follow Buffalo St. east to the parking lot at Surprise Corner (parking for the Bow Falls Viewpoint), a distance of about 1.2 km. Spray River Loop 12.0 km round trip, elevation gain 65 m, 3-4 hours round trip Trailhead: Follow Spray Avenue from the Bow River Bridge to the Banff Springs Hotel. Go past the hotel parking facilities to the trailhead parking lot. Follow the Spray River trail upstream for 6 km to a footbridge. 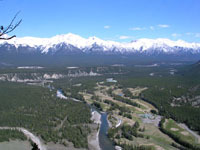 Cross the river and return downstream along the eastside of the valley to Banff Springs Golf Course Road. 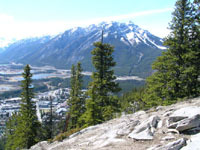 Sulphur Mountain 5.5 km one way, elevation gain 655 m, 3.5 hours round trip Trailhead: Follow Mountain Avenue about 4 km from the Bow River Bridge to the Upper Hot Springs parking lot. The trail leaves from the corner of the lot closest to the pool. Sundance Canyon 4.3 km one way, elevation gain 145 m, 3 hours round trip Trailhead: From the Bow River Bridge drive 1.6 km to the Cave and Basin parking lot. Walk past the building to the start of the bike path. Stoney Squaw Mountain 2.1 km one way, elevation gain 190 m, 2 hours round trip Trailhead: From the Mt. Norquay Interchange follow Mt. Norquay Road about 6 km to the Norquay ski area. Just inside the main parking lot, on the right, is the trail sign. Cascade Amphitheatre 7.7 km one way, elevation gain 640 m, 6 hours round trip Trailhead: Follow the Mt. Norquay Road approx. 6 km to the Mt. Norquay ski area. Park in the lot on the left and walk through the main parking lot and past the ski lodge. Cory Pass 5.8 km one way, elevation gain 915 ml 6 hours round trip Trailhead: The Fireside Picnic Area at the eastern end of the Bow Valley Parkway. Follow a 1 km access road from the parkway to the picnic area. This is one of the most strenuous hikes in Banff National Park. 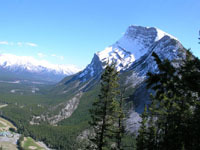 Strong hikers who are good route finders can return from Cory Pass by making a ioop around Mount Edith and descending the Edith Pass trail (13 km round trip). Check a trail guide for detailed directions. Edith Pass 4.6 km one way, elevation gain 640 m, 4-5 hours round trip Trailhead: Same as Cory Pass. Taxi Mike’s Guide to Banff Spring Web Edition, 2006.